1 of 5 In a large bowl, combine mustard, brown sugar and vinegar. Add sausage and onion and toss to coat. 2 of 5 Place sauerkraut in a 4-quart slow cooker. 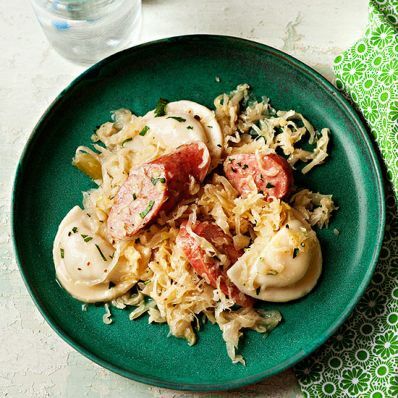 Spoon sausage and onion mixture on top of sauerkraut. 3 of 5 Cover and cook on LOW for 6 to 8 hours or HIGH for 3 to 4 hours. 4 of 5 When ready to serve, add frozen pierogies on top. Cover and cook on HIGH about 40 minutes more, until pierogies are heated through. 5 of 5 Stir gently to combine and serve. Per Serving: 733 mg sodium, 12 g pro., 7 g Fat, total, 196 kcal cal., 2 g fiber, 22 g carb., 2 g sat. fat, 42 mg chol.